Jason attempts to bond with Bizarro, and Bizarro starts to "play rough" with him. Being simple minded, Bizarro doesn't trust Jason at first, until Jason finds a way to gain it by using the soft toy he brought to his cell earlier, a stuffed Superman plush toy. Artemis looks on, at the ready, in case she needs to step in, and rescue Jason, from her own holding cell. Black Mask observes the ordeal from afar, pleased with how Jason was able to diffuse a possible difficult situation without the use of any weapon. Later Black Mask talks with Jason over dinner, and takes him to his own hidden treasure room/armory. Artemis follows in the shadows, and listens as Black Mask explains that he did indeed posses the Bow of Ra that Artemis is looking for, but had sold it back to the country of Qurac for a profit. Artemis hears this news and leaves. Jason anticipates as much. 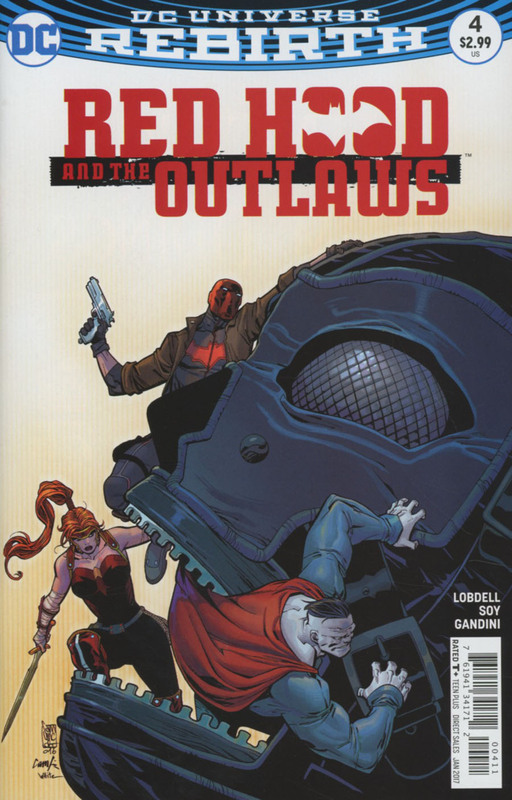 Black Mask goes on to explain, that he and Red Hood/Jason are kindred spirits, and that he knows that Gotham would be so much better, if the Jokers and the Two Faces, etc., weren't in it. He reveals that he has known all along, that Jason secretly plans to take him down. Black Mask reveals the techno-organic virus that he had used to control the Mayor, a control that he lost due to Jason's "assassination" attempt, which was really a cover to save the mayor's life. In the final scene, Black Mask reveals that he now posses the ultimate weapon to bring about his rule, as Bizarro crashes into the room, under obvious control of Black Mask through the techno-organic virus. Story - 5: What can I say about this book, that I haven't said already? It is one of my absolute favorites, that DC has offered since Rebirth! 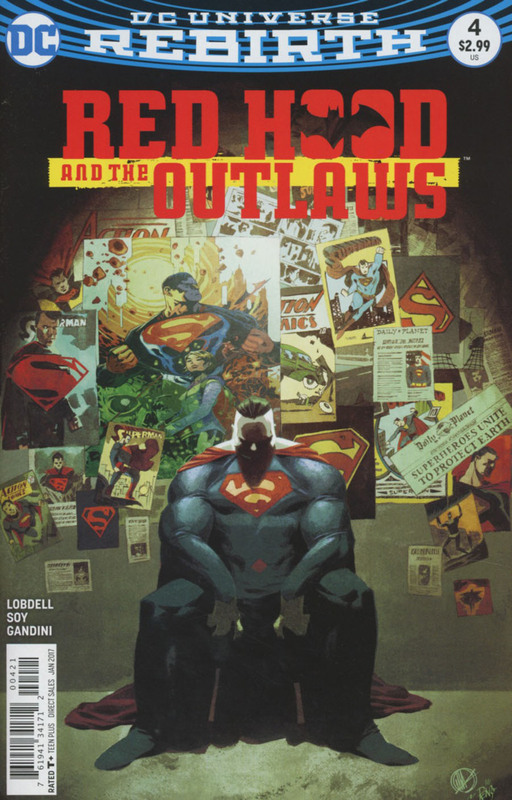 Lobdell is doing such a fantastic job with it. I really enjoy the "slow burn" storytelling technique he uses on this book. I love the way in which he introduces elements early on, that come into play as the story progresses. Now you may say that all writers pretty much do that, but we are only 5 issues into this series, and already there have been so many call backs to elements set up in the Rebirth special as well as issue #1. The best moment this issue wasn't Bizarro's child like nature, and rough housing with Jason, nor was it the flashbacks to Artemis' quest for the Bow of Ra. No, it was Black Mask's monologue to Jason about his upbringing. He shows Jason a family portrait of he and his parents. He explains that his parents didn't pay any attention to him, or showed love. Hence why he does what he does now! Now it is easy to say that he being a neglected child, turned to a life of crime and killed his parents (similar to Lex Luthor Post COIE). Or you could look at in a way that Black Mask is an "Anti-Bruce Wayne". I know as fans, we like to harp on about how Batman loves to cry over his dead parents. Here we see, just exactly what path Bruce could have gone down, had the Waynes not been so loving toward Bruce. Something Batman shares with Superman, loving parents that raised him right. I thought this was an excellent way to showcase why the good guys are good and the bad guys are not. Another aspect I loved was the subtle undertone of how Jason is standing on a fine line of good and evil. He shares Black Mask's views of a better Gotham without the "freaks", but keeps to the code that Batman has set (barely at times). Obviously Jason takes center stage in each issue, but we are slowly getting more and more on Artemis and Bizarro. And now with this issue, Black Mask. Lastly I just want to mention that I love that Lobdell straight out swiped the name Techno-Organic virus straight from the X-Men. Art - 5: Dexter Soy... One of the best artists at DC right now! Soy has shades of Joe Maduriera in his art. And as I've always said, he has a really good grasp on how to use shadows to their best advantage. The scene I mention in the story part of the review, where Black Mask shows Jason a family portrait, emulates the Wayne's in so many ways. I love the point of view from the ceiling, looking down, gave that small scene such gravitas. Soy's character models remain on point. He never seems to deviate from it too far, even when he uses a more Manga influence in a particular scene. And he seems to be making the hulk like Bizarro work in the context of the story so far. I loved the final splash page. Really left me wanting more. Veronica Gandini's colors are as much a part of the art as Soy's pencil and inks. She manages to really capture the mood of the scenes as well as extenuate the figure work Soy does with the art. They make an excellent art team! Cover Art - 5: The main cover by Giuseppe Camuncoli and Cam Smith is an interesting composition. Each character appears to show their strengths against a giant Black Mask head trying to swallow up our heroes. The variant cover by Matteo Scaler and Moreno Dinisio however is absolutely brilliant! A great piece of art showing the dark nature of Bizzaro who always sits in Superman's shadow!